The neoconservative Brookings Institute think tank authored a 2009 strategic publication about the most efficient way for the US to asymmetrically destabilize Iran, titling their blueprint “Which Path To Persia? Options For A New American Strategy Towards Iran”. Eurasian geopolitics has been completely upended in the 7 years since that document was first published, and many (but crucially, not all) of the precepts mentioned within it are outdated and irrelevant to the contemporary international context. That said, the concept of trailblazing the best Path to Persia still remains attractive, though no longer just for the US and this time towards completely different ends than the original idea had planned for. The rise of China and the unveiling of the worldwide One Belt One Road strategic vision have led to the People’s Republic taking a keen interest in directly connecting itself with the Islamic Republic, and herein lies the foundation for forging a different sort of Path to Persia. The US was working to achieve unipolar zero-sum destabilization in order to weaken Iran, but China wants to build multipolar win-win connectivity in order to strengthen its partner, thereby making Washington and Beijing’s Paths To Persia fundamentally different from one another. The American strategy has long been discussed and was often referenced in many analytical commentaries all throughout the years, especially among the alternative media community, but comparatively less has been said about the Chinese one. The most obvious reason for this is that it was only until fairly recently that the US and Iran were at serious loggerheads with one another, but the nuclear deal and the progressive lessening of the anti-Iranian sanctions played a large role in bring the two erstwhile enemies together for an historic rapprochement. Furthermore, the Western-friendly influence of President Rouhani and his “moderate” followers – especially among the more than half of the population under 35 years of age – played a pivotal role in bringing this about, though it must be said that this would have been impossible had the “conservative” Ayatollah not (belatedly) given it his blessing. The post-sanctions geopolitical environment that Iran now finds itself in allows the rest of the world to more confidently engage with this dormant giant and help it reach its destined economic potential. Accordingly, and in line with the integrational principles of the One Belt One Road vision, China is endeavoring to build a series of transnational connective infrastructure projects in order to tie the two countries together and jumpstart a new golden era of bilateral relations. China doesn’t just have one Path To Persia, but three, though each route aligns with the general East-West geographic paradigm that characterizes most of Beijing’s other New Silk Road projects (with the North-South ASEAN and Balkan Silk Roads being the most notable exceptions). The physical basis for all three Paths to Persia was set this year, thus denoting 2016 as the time when the Chinese-Iranian Strategic Partnership took a major step forward precisely at the moment when Beijing’s relations with New Delhi suffered multiple American-designed setbacks. Should the following New Silk Road initiatives successfully pan out and spearhead the creation of a sustained geo-economic corridor linking these Resistant & Defiant multipolar anchors, then Iran might interestingly come to replace India in forming the “I” in BRICS. China and Iran achieved rail interconnectivity for the first time in their history earlier this year after a freight train reached Tehran from Zhejiang Province (just south of Shanghai) by means of traversing Kazakhstan and Turkmenistan. The author dubbed this route the ‘Steppe Silk Road’ because of the fact that it must journey across Kazakhstan’s barren wilderness before reaching the Mideast country. Although operational, this route has yet to be fully maximized, and this is possibly because of its inherent geo-economic constraints which inversely serve to safeguard its geostrategic security. This route’s shortcoming is that it barely passes through any significant Central Asian population centers, thereby mostly operating only as an Iran-China railway that circumstantially happens to pass through the region. This insulates the Steppe Silk Road from many of the adverse Hybrid War scenarios that might one day play out in Central Asia, but it also holds it back from ever becoming a crucial infrastructural component in driving this region’s development, despite its transregional connectivity in linking together the Mideast and East Asia. The most direct route between China and Iran passes through the most populated portions of Central Asia, and although not yet linking up with Iran, it has at least reached Afghanistan in a first-ever achievement. China announced in early September that it opened a new commercial rail corridor between itself and Afghanistan, with Bloomberg mapping the route out as having passed through Almaty and Tashkent along the way to a tiny border town just north of Afghanistan’s third-largest city of Mazar-i-Sharif. This accomplishment leaves open the possibility for one day expanding the existing terminus near Mazar-i-Sharif to the western city of Herat and thenceforth into Iran, taking advantage of the fact that the northern Afghanistan is usually much more peaceful than the rest of the country and thus the most obvious location for building transnational connective infrastructure projects. The problem, however, is that nobody really knows for sure whether this part of Afghanistan will forever remain stable or not, seeing as how the Taliban surprised the world last fall when they took over Kunduz, which symbolically was the first time that they had seized a regional capital since they were dislodged from power back in 2001. 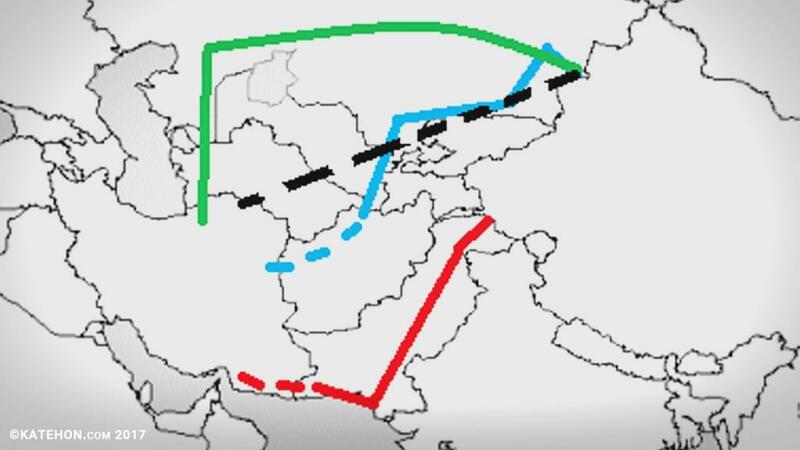 Not one to take risky chances and put ‘all its eggs in one basket’, China of course has a supplementary Central Asian Silk Road project proposal which totally avoids Afghanistan yet still envisions linking together Almaty, Bishkek, Tashkent, Samarkand, Bukhara, and Ashgabat. First floated in November 2015, the plan calls for China to build a high-speed rail network between these large cities in ultimately connecting the Xinjiang regional capital of Urumqi to Tehran. This would ideally be the best Central Asian Silk Road that all sides could hope for, though the potential downside is that it is highly vulnerable to any geopolitical shocks that might occur, which could be the main explanation as to why the project has yet to get off the ground and China uncharacteristically isn’t displaying any sense of urgency about it. The most newsworthy event to happen in Chinese-Iranian relations in the post-sanctions environment and perhaps even in all of their history took place on the sidelines of the UN General Assembly when Iranian President Rouhani told his Pakistani counterpart about his country’s eagerness to participate in the China-Pakistan Economic Corridor (CPEC), much to the obvious chagrin of New Delhi which had tried its utmost to keep Tehran focused solely on the Indian-financed North-South Corridor terminus of Chabahar. India’s active courtship of Iran would have probably succeeded in keeping the Islamic Republic away from this project had it not been for New Delhi’s publicly reckless promotion of Baloch separatism in Pakistan, which Prime Minister Modi shockingly hinted at during his mid-August speech commemorating India’s Independence Day. It’s been long suspected by outside observers and convincingly proven by Pakistan’s Inter-Services Intelligence (ISI) that India’s Research and Analysis Wing (RAW, it’s version of the CIA) was behind the history of violence that has broken out in this southwestern province for decades, yet India always officially denied it and sternly rejected any innuendo that it foments terrorism there. It’s for this reason that Modi’s audacious proclamation certainly caught everyone off guard, not least of which were the Iranians, which have historically had their own Baloch separatist insurgency to contend with. Iran knows that an Indian-backed insurgency in Pakistani Balochistan can easily spill across the border into its own province of Sistan and Baluchistan, which ironically hosts India’s prized investment port of Chabahar and could thus put the entire North-South Corridor in jeopardy. Iran’s existential concerns about the strategic carelessness of India’s latest anti-Pakistani proxy war probably explain why Rouhani also told Prime Minister Nawaz Sharif that “Pakistan’s security is our security and Iran’s security is Pakistan’s security”. Apart from carrying a powerful meaning in being proclaimed during the height of India’s war cry against Pakistan, the Iranian leader’s statement might actually deal more with Balochistan than Kashmir. Sensing India as an indirect threat to their territorial integrity for the first time in their history, despite New Delhi’s smiling assurances of North-South Corridor cooperation, Iran was pushed to take the fateful step in declaring that it wants to work with CPEC, understanding that the geopolitical threat posed by foreign-backed Balochistan can only be adequately dealt with in trusted coordination with Pakistan, and by extent, China. China and Iran have wasted no time in strengthening their full-spectrum cooperation with one another in the wake of the nuclear deal and the Islamic Republic’s emergence from international ‘isolation’, and nowhere are the fruits of this work more tangibly visible than through the three Paths to Persia that Beijing is strategically paving to its strategic partner. It used to be assumed that the two sides would only ever be able to conduct overland trade with one another via Central Asia, seeing as how Afghanistan has been a warzone for decades and Iran presumed that Pakistan was unreliable, but the prolonged (and relative) stabilization of northern Afghanistan combined with the pioneering CPEC project have reengineered the geo-economic situation in the strategic West-Central-South Asia transit space. China and Iran now have the potential for connecting with one another not just through the Central Asian country of Turkmenistan, but also by means of Afghanistan and Pakistan, thereby making each of Iran’s three eastern neighbors a potential access point for reaching China. The most promising them all, however, is Pakistan, which has the chance to function as a South Asian energy corridor between West and East Asia, though this pivotal route wouldn’t have ever truly caught Iran’s attention had it not been for India’s bumbling policy of supporting Pakistani Baloch separatism. Ties between Tehran and New Delhi were of a very high and strategic nature hitherto Modi-Doval’s latest scheme, with both sides cooperating on the North-South Corridor and expecting a bonanza of win-win benefits to eventually ensue. Iran is still dedicated to this multilaterally beneficial project (which also includes Azerbaijan, Russia, and the EU), but it’s just that it no longer feels obliged to abide by the ‘gentlemen’s agreement’ of avoiding CPEC in exchange for privileged Indian investment and political attention, considering how New Delhi’s boorishness is now threatening to spread instability along the Islamic Republic’s vulnerable eastern frontier. It’s therefore not surprising why Iran would so loudly express its enthusiasm to take part in CPEC and consequently position itself to de-facto replace India in BRICS.